More surprises continue to unfold at the 100%-owned Gumberg project. As has been explained by me and others, the area has a long history of production, (the Östra Silverberg Mine was the largest silver mine in Sweden between 1250 and 1590), but very little modern exploration. 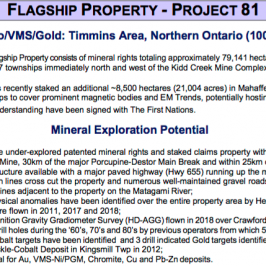 Boreal Metals (TSX-V: BMX) is changing that with new geologic interpretations, geophysical surveys and reconnaissance drilling that continue to lead to new exploration targets. Readers may recall, Gumsberg is a brownfield property, host to over 30 historic mines. 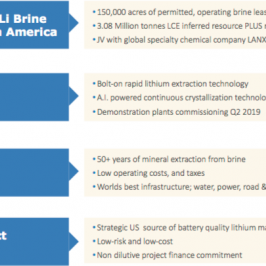 Boreal has a diversified portfolio with massive exploration potential — base, precious & battery metals projects, with over 18 targets currently being developed. 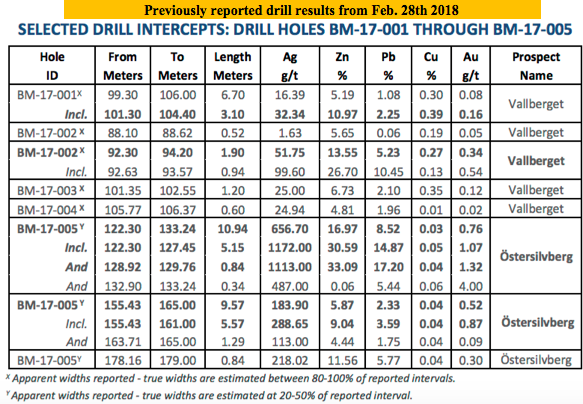 The focus of this article is Gumsberg’s latest drill results. 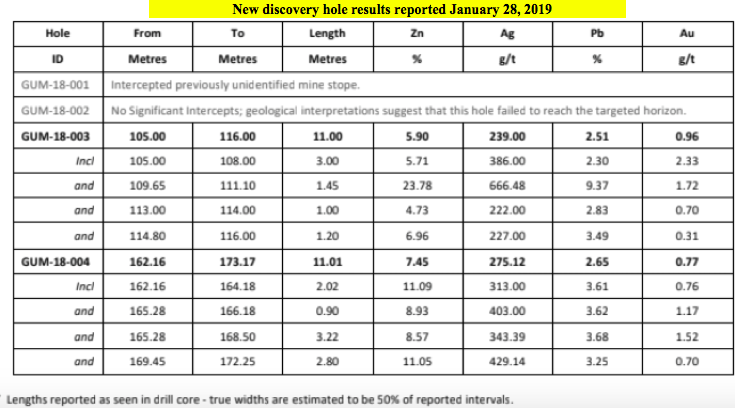 The diamond drilling in this 9-hole program tested for mineralization to the east and west of last year’s drill program which included the Company’s best hole BM-17-005, that returned an intercept of 10.94 m of 16.97% zinc, 656.7 g/t silver, 8.52% lead & 0.76 g/t gold. (see Boreal News Release dated February 28, 2018). The new holes, GUM-18-003 and GUM-18-004 (see chart above) both delivered 11.0 m high-grade intercepts. GUM-18-003 returned 5.9% zinc, 239 g/t silver (7.7 troy oz. ), 2.51% lead & 0.96 g/t gold. GUM-18-004 assayed 7.45% zinc, 275.1 g/t silver (8.85 troy oz. ), 2.65% lead & 0.77 g/t gold. The above image ties together the new results with historical drilling. As can be seen in the diagram, the new red colored GUM-18-003 and GUM-18-004 holes are separate from the cluster of blue colored drill holes from early last year. Notice that holes GUM-18-006 & GUM-18-008 also intercepted the mineralized body shown in the press release as pink circles. The mineralization is cosmetically similar to that of GUM-18-003 & GUM-18-004 and Boreal is looking forward to getting these results. If the results are similar, that would show some continuity, which would warrant further drilling in this exciting area. 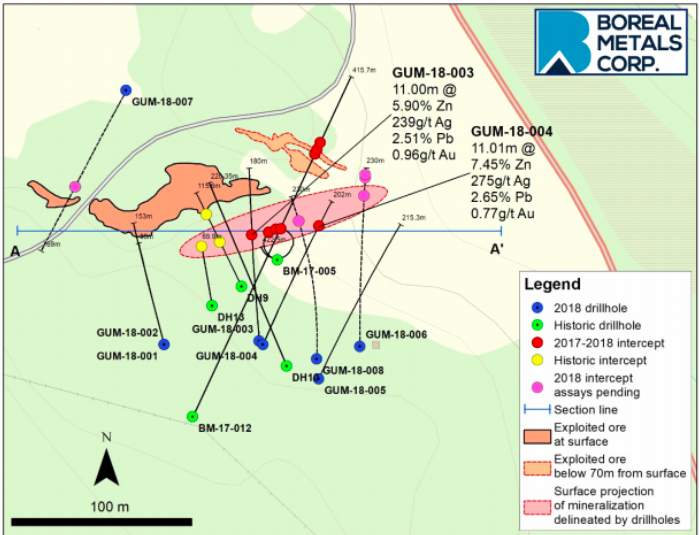 While it’s still early days for Boreal, for instance there’s no maiden mineral resource estimate yet at Gumsberg, compare the high-grade intercepts that Boreal is hitting to the 2017 year-end reserves & resources (see above) of nearby producer Boliden. 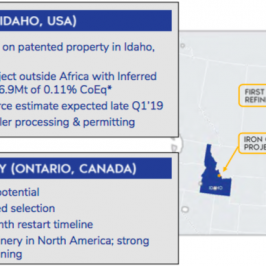 The intercepts that Boreal has released are sufficient to warrant the term discovery however, bear in mind that this is still an early-stage project. Follow up drilling is required to determine whether these strong drill results will ever become part of an economic deposit. 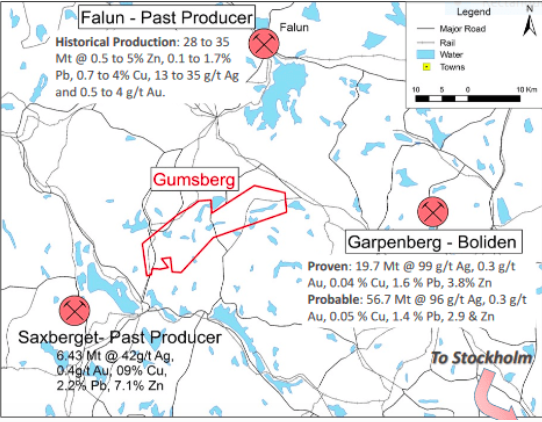 For now, the grades and thicknesses that Boreal has uncovered at Östra Silverberg are significant, especially given the closeness to the 2 giant precious metal enriched base metal mines (Boliden’s Garpenberg and Lundin Mining’s Zinkgruvan)..
Another possibility is that pockets of high-grade mineralization at Gumsberg could become satellite deposits for Boliden’s or Lundin’s mines in the district. Boreal would toll mill their metals through the other’s processing facilities. But, this is most likely not a near-term scenario. Boreal Metal’s high-grade drill holes also compare favorably with past producers Falun & Saxberget, with the same caveat — before a maiden mineral resource estimate, Boreal remains highly speculative. Still, management is encouraged by their drill programs to date. They have hit several very good-to-excellent holes. And, as mentioned, they are excited about 2 of the remaining 5 holes awaiting assays. Boreal has moved the ball forward with these results, yet the current market cap is C$5.0 M = US$3.8 M, hardly an aggressive valuation. The share price closed at C$0.33 on February 28, 2018, the day when the first great drill results done by Boreal were announced. Now, despite continued exploration success, the share price is C$0.085. To be fair, most base, precious and battery metal junior companies have seen their share price halved or more from 52-week highs. But, how many of those are actively drilling? And how many are lodging strong results? There have not been many big, important discoveries in Sweden recently. 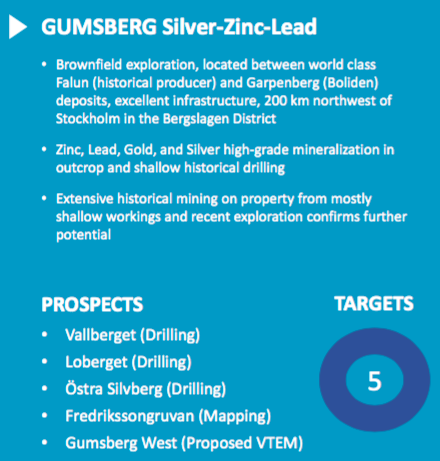 The infrastructure near the Gumsberg project is excellent because of the proximity of Boliden’s Garpenberg and Lundin Mining’s Zinkgruvan mines, both of which are large underground operations. Boreal Metals (TSX-V: BMX) is prudently and successfully drilling on a significant land package of 18,300 hectares in the famous Bergslagen Mining District. 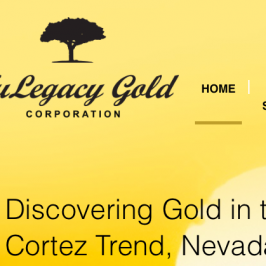 Management just announced 2 high-grade discovery holes, with more results expected in February. The Company has EMX Royalty Corp. as a 9.4% shareholder and strategic partner actively involved with the development of exploration programs. Boreal’s market cap is just C$5.0 M / US$3.8 M.
Silver prices have moved higher recently from about US$14/oz. in mid December to US$15.75/oz. (+12.5%) on January 25th. 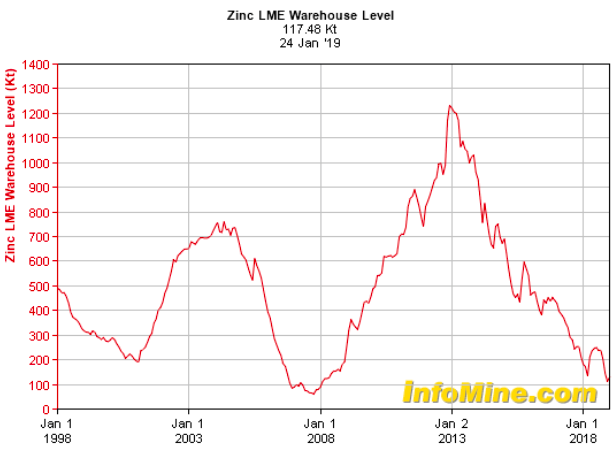 Zinc inventory through January 24, 2019, as measured by LME warehouse levels, (see chart above) is looking bullish for zinc pricing. Rising metals prices could improve sentiment in the metals & mining sectors. Combined with drilling successes, if/when market sentiment improves, Boreal Metals, with just 58.5 million shares outstanding, could be among the first to move higher. 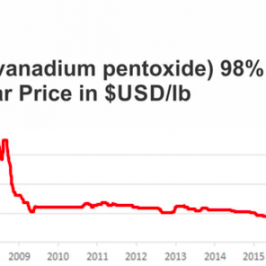 Readers might want to consider doing more due diligence on this zinc, silver, lead, gold opportunity in an ultra-safe jurisdiction. Disclosures: The content of this article is for information only. Readers fully understand and agree that nothing contained herein, written by Peter Epstein of Epstein Research [ER], (together, [ER]) about Boreal Metals, including but not limited to, commentary, opinions, views, assumptions, reported facts, calculations, etc. is not to be considered implicit or explicit investment advice. Nothing contained herein is a recommendation or solicitation to buy or sell any security. [ER] is not responsible under any circumstances for investment actions taken by the reader. [ER] has never been, and is not currently, a registered or licensed financial advisor or broker/dealer, investment advisor, stockbroker, trader, money manager, compliance or legal officer, and does not perform market making activities. [ER] is not directly employed by any company, group, organization, party or person. 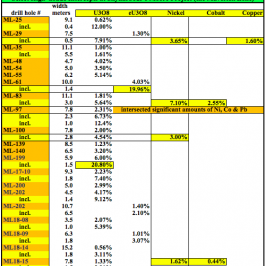 The shares of Boreal Metals are highly speculative, not suitable for all investors. Readers understand and agree that investments in small cap stocks can result in a 100% loss of invested funds. It is assumed and agreed upon by readers that they will consult with their own licensed or registered financial advisors before making any investment decisions. At the time this article was posted, Peter Epstein owned shares in Boreal Metals and it was an advertiser on [ER]. Readers understand and agree that they must conduct their own due diligence above and beyond reading this article. While the author believes he’s diligent in screening out companies that, for any reasons whatsoever, are unattractive investment opportunities, he cannot guarantee that his efforts will (or have been) successful. [ER] is not responsible for any perceived, or actual, errors including, but not limited to, commentary, opinions, views, assumptions, reported facts & financial calculations, or for the completeness of this article or future content. [ER] is not expected or required to subsequently follow or cover events & news, or write about any particular company or topic. [ER] is not an expert in any company, industry sector or investment topic.